I came across this recipe recently and thought it looked like a fresh, light, end-of-winter dish that would be easy to throw together and keep in the fridge for a day or two. After considering the ingredients, I decided to leave out the cauliflower — I’m not a big fan of it raw — and add some celery for a hint of green. The result was flavorful and nutritious. This salad’s hint of citrus would make it a great end to a meal. Or you can do like I did and bulk it up with some quinoa and roasted sweet potatoes for a hearty lunch salad. Feel free to experiment with your version, and let me know how it turns out! Two Years Ago: Venice/Venezia/Венеція and Venice, Part 2: Food! In the bowl you’ll use for the salad, whisk together the lemon juice and zest, vinegar, olive oil, thyme, salt and pepper. Dump in the can of beans and stir to coat them. Chop the fennel and celery and add them to the bowl. 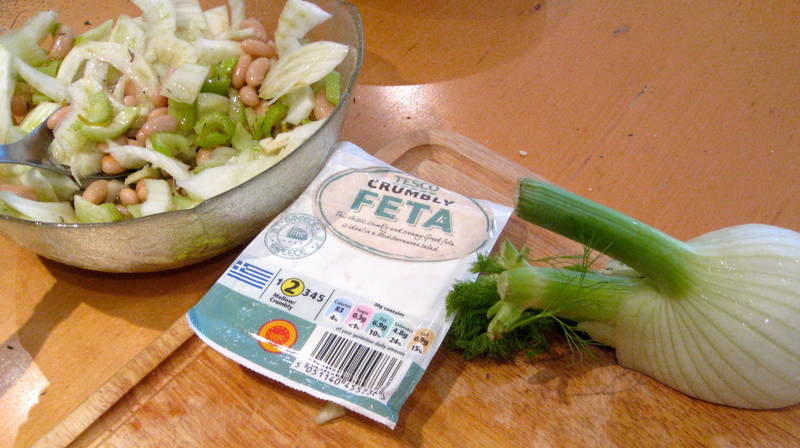 Crumble the feta on top and toss gently. This entry was posted in climate, food, health, pictures, recipes and tagged salad on 27.03.2013 by taplatt.